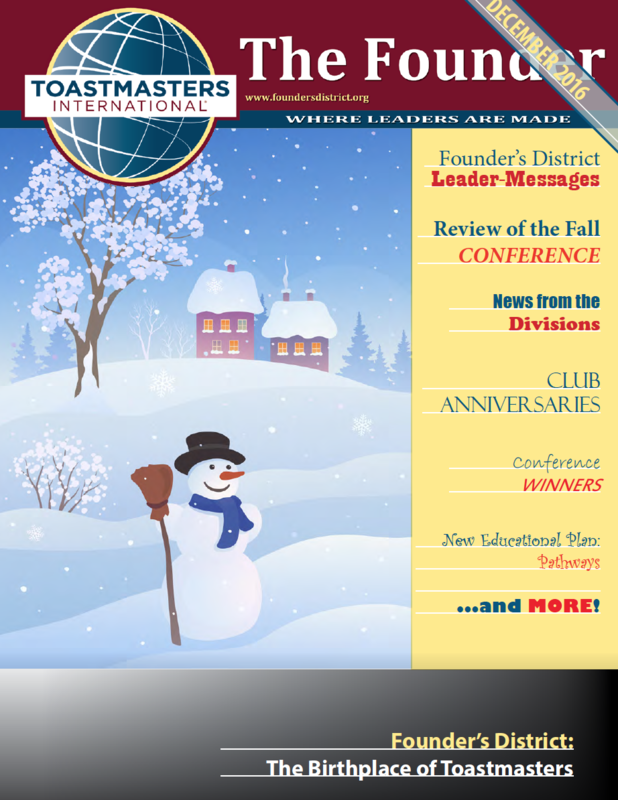 From Rubber Chickens to Yodeling Pickles! 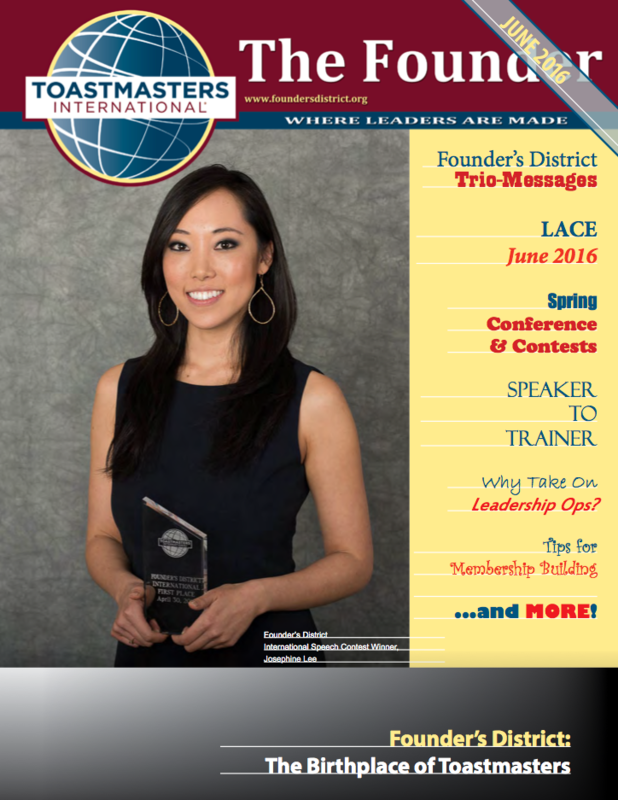 Josephine Lee Brings Home Big Trophy! 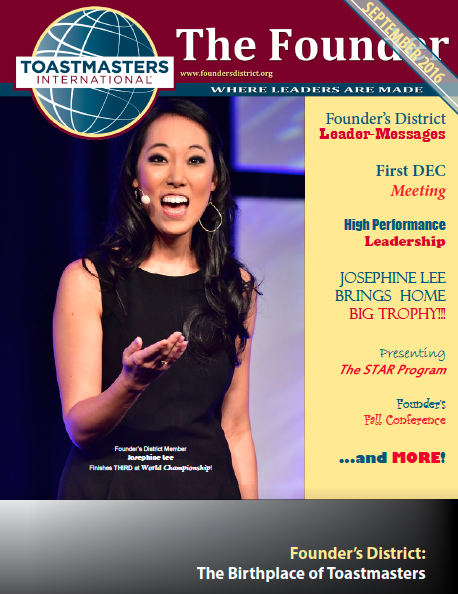 Founder's District International Speech Contest winner, Josephine Lee. 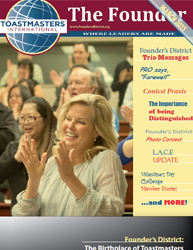 Founder's Leaders - Get to know the new Founder's District Leadership team. 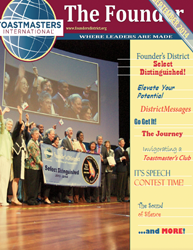 ISD Toastmasters Youth Leadership Program Graduates First Class! 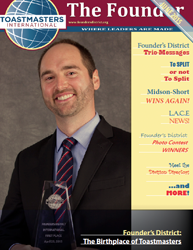 Daniel Midson-Short wins the 2014 District International Speech Contest, now on his way to Kuala Lumpur. 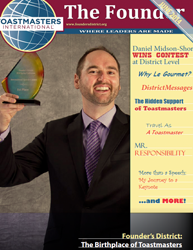 Why Le Gourmet? 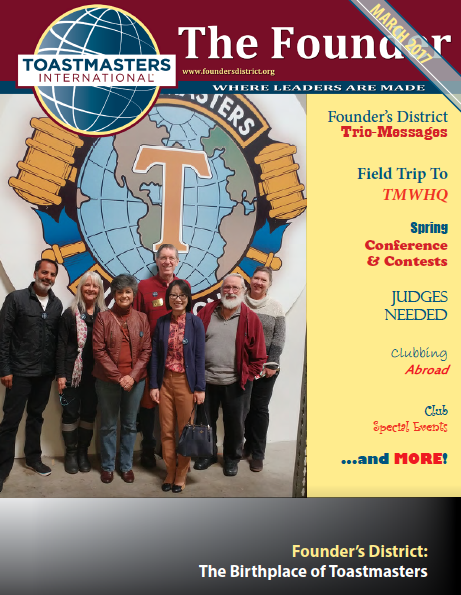 Read and find out. 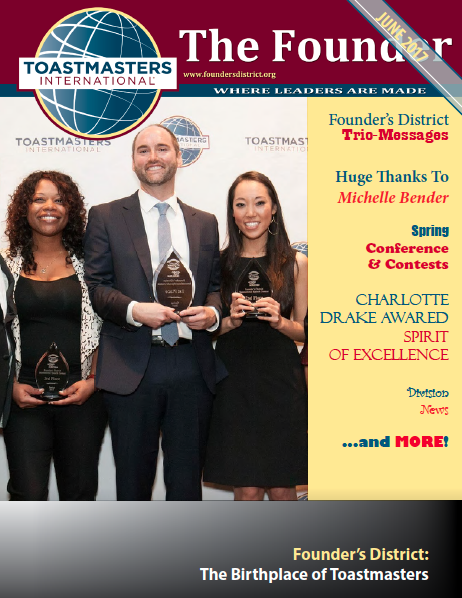 The Hidden Support of Toastmasters. 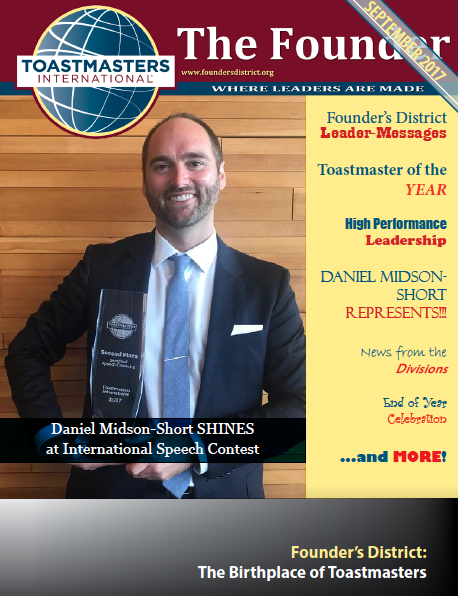 More than a speech: My Journey to a Keynote. 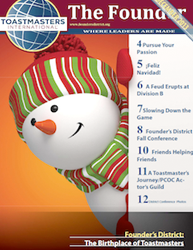 ... and 'Find Founder' again. 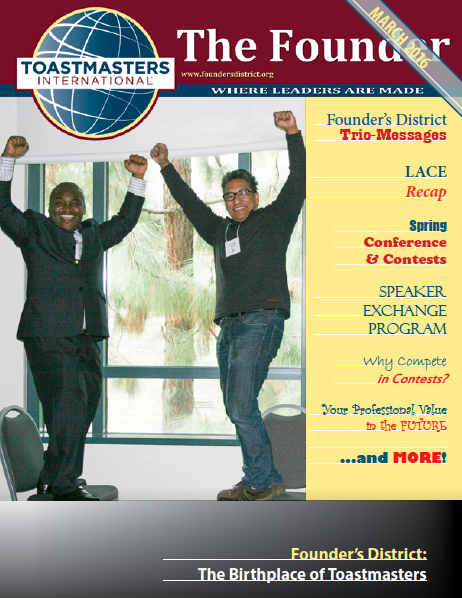 Find "Founder" and score Conference Tickets! 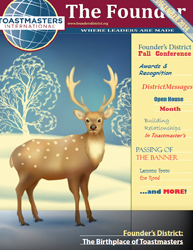 Happy Birthday to Founder's District. 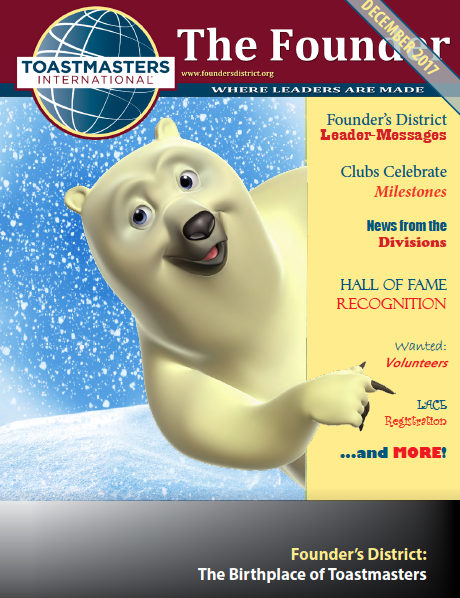 Interviews with Jennifer Elam, Division Governor of the Year, and Alex Ruiz, Toastmaster of the Year. 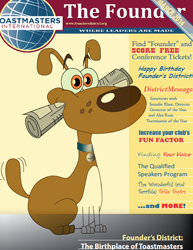 Increase your club's Fun Factor. 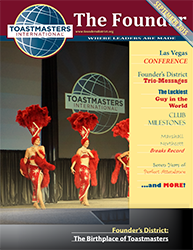 The wonderful (and terrible) Table Topics. 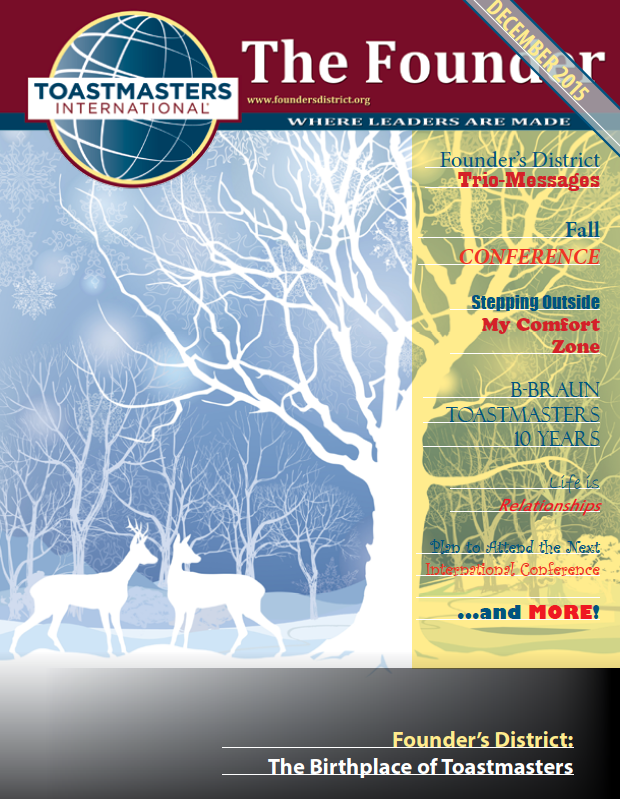 In this issue: David Moore wins the 2013 Humorous Speech Contest, a feud erupts at Division B, slowing down the game, friends helping friends, a Toastmaster's journey, and Feliz Navidad. 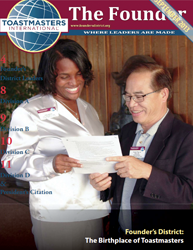 Division spotlight - Linda Brown, Ryan Matsunaga, Jack Schmidt, Norm and Frannie Stein. 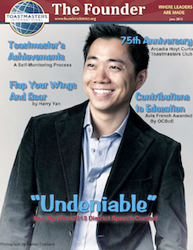 In this issue: Mun Ng wins the 2013 District Speech Contest, Arcadia Hoyt Curtis celebrates their 75th anniversary, Avis French recieves an award from OC Board of Education. 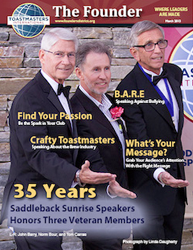 In this issue: Saddleback Sunrise Speakers celebrates their 35th anniversary, Deborah Reisdorph speaks out against bullying, new Toastmasters club - Brewmeisters, and learn to grab your audience's attention with the right message.